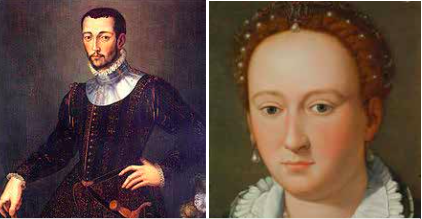 1) One of the most scandalous and debated illicit love affairs that oc- curred in Florence was that be- tween the Grand Duke Francesco I de’ Medici and Bianca Cappello during the sixteenth century. Let’s see what happens when a rich, powerful, married man falls for a poor, beautiful girl married to an- other. Bianca was a noble Venetian young woman who had eloped to Florence to marry, at the age of 15, a penniless Florentine, Pietro Bonaventuri. Beautiful as she was, she soon became popular in the city and drew the attention of many, including that of the Grand Duke himself, who appointed her husband as ‘Keeper of the Royal Wardrobe’. Of course, it was a move to keep her close to him in the palace. Let’s skip a few passages now, leaving the reader free to use his/ her imagination. Shortly after, penniless Bonaventuri was murdered in the streets of Florence. The circumstances of his death re- main obscure. As it often happens when important rich people are involved, the court never came to a definitive verdict. Well, what happened after was that in 1576 Bianca gave birth to a baby who looked ex- actly like Francesco. There is more. Two months after the death of Francesco’s wife, Joanna of Austria, in 1578, Frances- co and Bianca were married. The timing of the event, following on the heels of the grieving period, caused widespread scandal. In addition, after Joanna’s death the existence of the illegitimate Don Antonio and his claim to the duchy were publicly acknowledged. You think the story is finished? Not at all. Francesco and Bianca died within days of each other in 1587, supposedly poisoned. On their mysterious deaths speculation fol- lowed for centuries until six years ago, when Francesco’s body was exhumed from the Medici Chapel at San Lorenzo and investigated. As evidence of a malaria-causing parasite was found in his remains, the debate was put to rest. Pen- niless Bonaventuri and wealthy Bianca neither revenged nor were revenged. 2) Ready for another love affair? This happened in the early nine- teenth century. The protagonists are Ugo Foscolo, a man with a strong passion for writing and for political freedom, and a woman by the name of Quirina Mocenni Magiotti. In Italy, double surnames like that of Quirina imply noble descendant. The location of their affair was the now-destroyed Villa Torricelli on Florence’s Bellosguar- do hill. It was precisely this place and this woman that inspired the verses of the famous, unfinished poem Le Grazie (‘The Graces’) in 1812. Those beautiful words, that Quir- ina was probably reading secretly from her aristocrat husband, are and were – all that remain of Ugo’s love for her. Ugo was in fact exiled to Switzerland and England after Austria regained control of Italy in 1814. His tomb lies in Santa Croce alongside those of Michelangelo, Alfieri, Galileo and Machiavelli. His verses for Quirina, forever unfinished as his love for her, are still studied in Italian schools. for liberty: in fact, Elizabeth also became a passionate supporter of Italian liberation and unification. The couple lived at Casa Guidi in Piazza San Felice for 15 years until Elizabeth’s death in 1861, the same year that the Kingdom of Italy was established. She is buried in the Protestant English Cemetery at Piazza Donatello. After her death, Robert returned to England with the son of the woman to whom he was secretly married. The couple had in fact left England to escape Elizabeth’s oppressive father, who disapproved of the match, and had subsequently wed in Florence. Even the most casual tourist senses, beneath the romantic lapping of the waves against the bridges and landings along its ca- nals, that there’s something death- ly about Venice. Is it because most mythologies locate the land of the dead across a body of water? Or maybe because Venice’s narrow, ill-lit passages are so much quiet- er than the car-trafficked streets of other cities? Perhaps it’s because classic novels like “Death in Venice” and “Across the River and into the Trees” have told us it’s a place where one goes to die. Or the suggestion that a gondola — judging by its length, width, black lacquer and hanging lamp is really a floating coffin? Whatever the reason, with Halloween at our backs and winter coming on, it’s time to curl up in front of the fire with a couple of thrillers from the late ‘60s that exploit the deserted, dark, and narrow passageways of the Serenissima.